One of our sisters is a quilter. 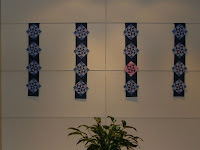 Here are four quilted hangings that she made for Advent. We are in the third week, thus the pink, for Gaudete, in the third one. Inner-city Erie has a bit of a challenge creating beautiful natural environments, but here's a red-berried bush after a snowstorm last week--right outside 345 East 9th--our original motherhouse site. There are a number of these berry-ladened bushes around--they truly rise to their most beautiful with the snow. The "O Antiphons" continue. They appear at Vespers in the Liturgy of the Hours December 17-23 and are sung online here. O Adonai, leader of the ancient Israel, giving Moses, while in the burning bush, the law on Sinai. Come with outstretched arms and teach us. O Root of Jesse, standing as protector of the people; silencing rulers, inspiring the people to make supplication. Come do not delay, deliver us. O Key of David, rod and staff of the house of Israel, one who opens and no one closes, the one who closes and no one opens. Come lead prisoners caught in darkness. O Dayspring, Sun of Justice, bright eternal light, one who shows the way, the one who sets us free even in darkness and death. Come disperse the gloomy clouds of night.